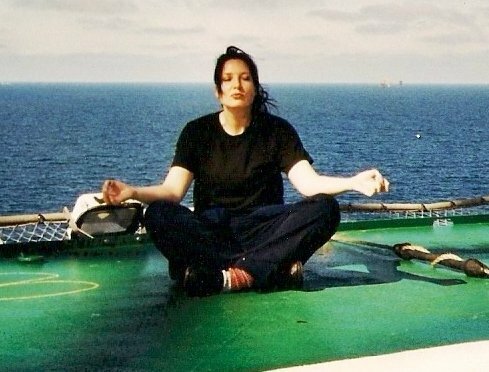 Before I became an Engineer I worked offshore on drilling rigs as a stewardess and Mechanical Engineer Trainee at Offshore Technology department - Dong Energy. 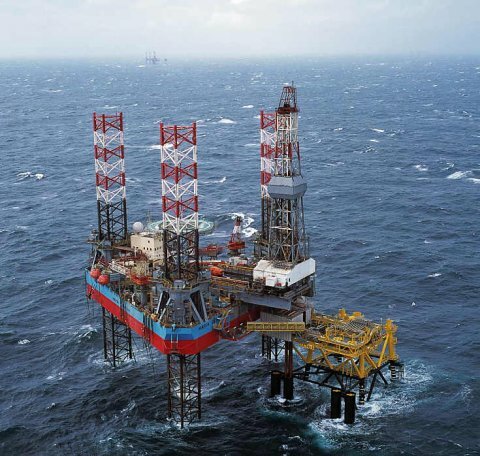 The oilrig Maersk Endeavour where I worked as a stewardess for more than 3 years. 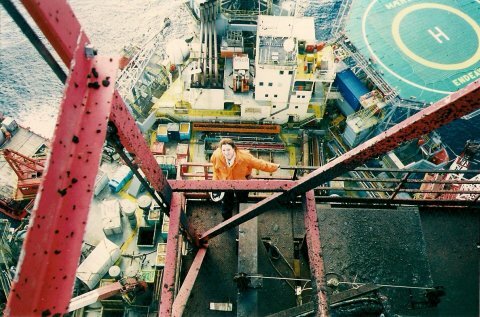 I am in the top of the derrick at the drilling rig Maersk Endeavour. 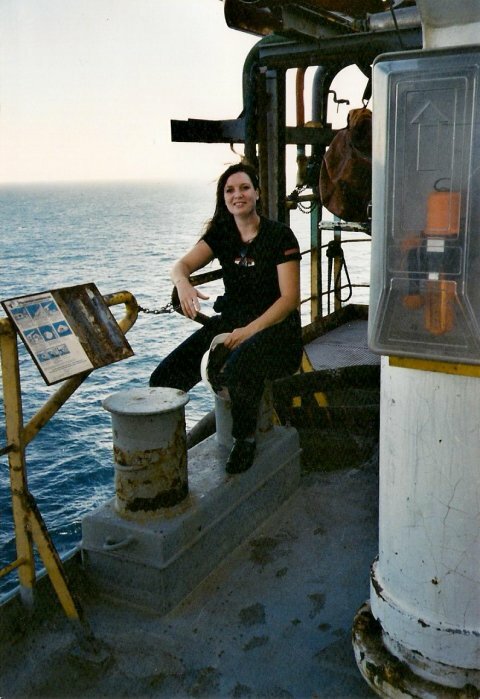 I climbed all the way to the top on the ladder on the side of the derrick. The derrick is 100m high - and, below you see the helideck. 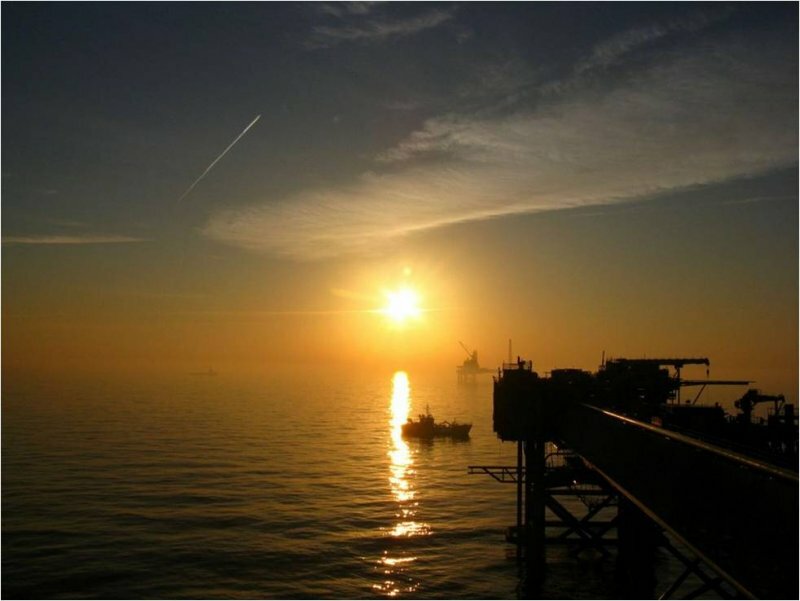 As an essential part of the security system on platforms a flair is always turned on to burn gas and condensate. In case you have to enter and work in a containe that contains gas you turn on some valves and the gas will be led to the flair. [...]Now and then gas is also reinjected to the underground. Excessed gas is also used as lift gas to maintain pressure in the reservoir so the oil can come up. On some platforms, the gas is sent to shore via pipelines. The picture shows the flair on Siri. In the various pipelines wax comes at a temperature of app. 40 degrees Celcius. To remove this wax "pigs" are used. 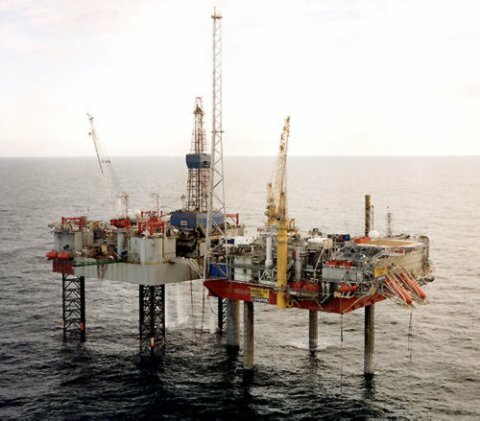 From the Siri platform to the Cecilie platform at the North Sea it takes app. 12 hours to get the pig through. 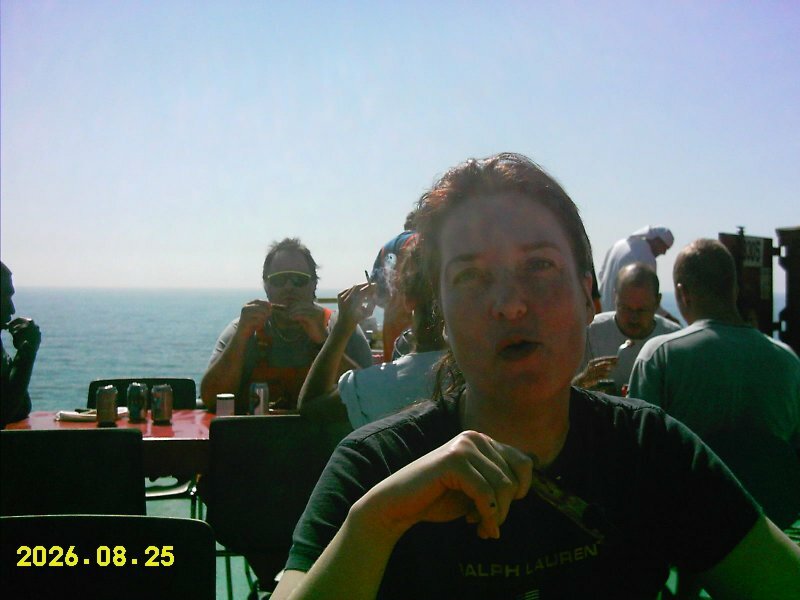 Pigs can also be used for other purposes [...]including inspection. The pig is sent through the same path as the fluid. The picture shows the transition from a smaller pipe to a bigger pipe. This takes the speed of the pig before "landing". During my internship I verified calculations for the bearing capacity of a new deck extension on the Siri platform for the operation of valves on new manifolds. The picture shows the deck where the deckestension should be. I was a part of a water injection project during some of the time in my internship. The picture shows injection pipes at Siri. In 2008 the water injection (WI) system on the Siri platform had to be upgraded due to environmental and safety reasons and to maintain optimal oil production. In connection with the upgrade a new booster pump 51-PA01C was going to be installed and the existing foundation was going to [...]be replaced. During my internship one of my major assignments was to make calculations to ensure no resonance would occur during operation of the pump. Because of my lack of experience with dynamic vibrations Dong Energy sent me to join a course “Dynamics for designers” in Norway during my internship. I appreciate Dong Energy gave me the opportunity to follow this course as I learned about dynamic vibrations. After I joined the course in Norway I was able to make the calculations. I used both manual- and Finite Element Calculations. My calculations verified that the system do not have the same natural frequency as the pump if the pump operation frequency is being kept below 65Hz and the speed below 3900 rpm. When this is to be kept no resonance will occur. The picture shows the existing pump including its frame on the existing foundation. 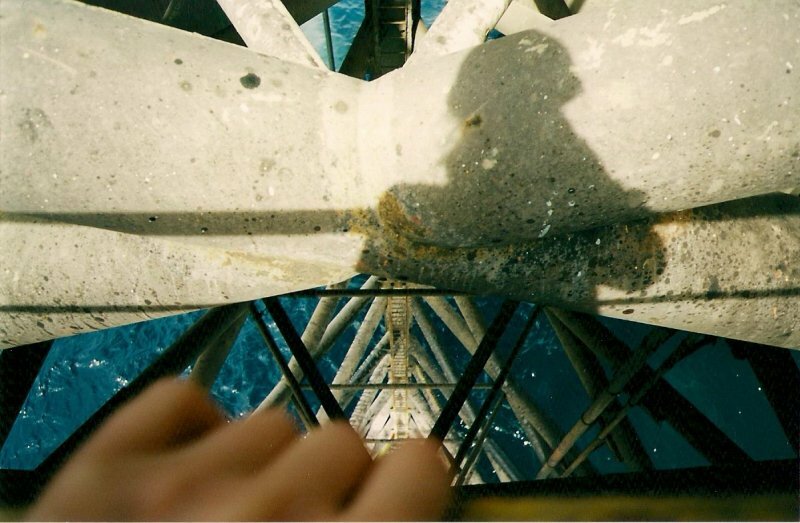 The wells are all located below the wellhead. The basic requirements for materials, dimensions, test procedures and pressure ratings for the wellhead and wellhead equipment are defined in API Spec 6A: Specification for Wellhead and Christmas tree equipment. Well Heads are cemented into place. The [...]valvearrangements on a wellhead is called a xmastree. The picture shows the "xmastrees" on Siri. The Halfdan field where I worked as a stewardess for more than 3 years. 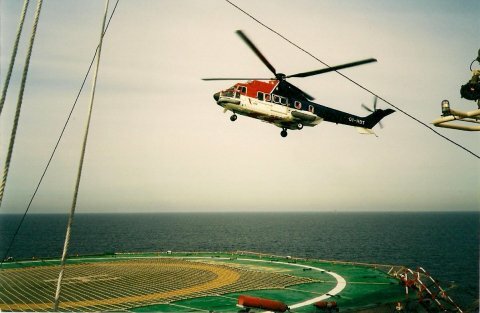 The chopper is about to land on Maersk Endeavour. 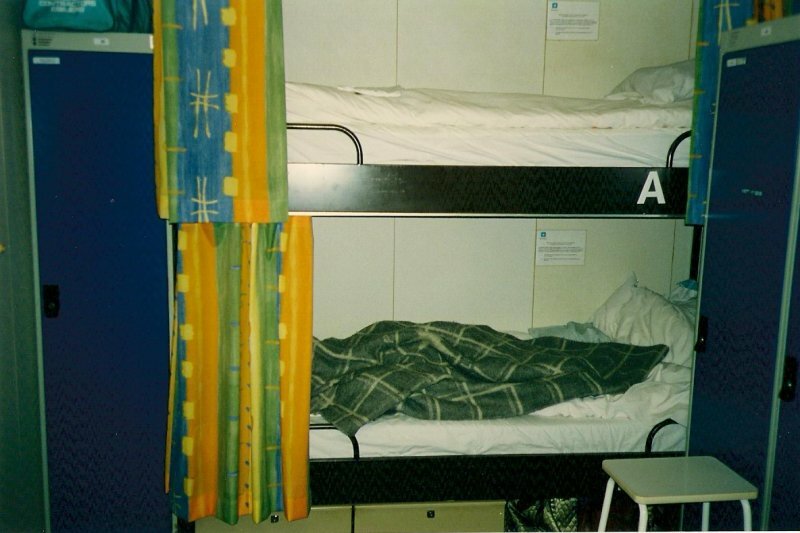 My room at Maersk Endeavour. I used to sleep in the bed below. 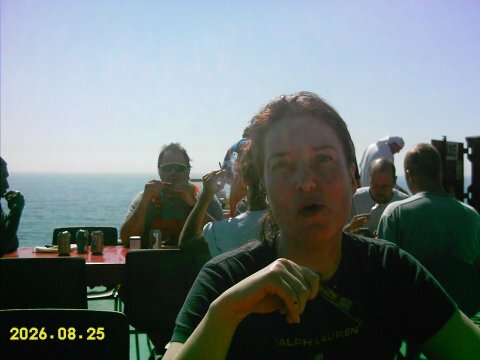 A sunny day with barbecue on the helideck on Maersk Endeavour. This is where I used to sit and relax on Maersk Endeavour. View from one of the legs. Another view from another leg. The Siri platform in the North Sea. I was at Siri in connection with my internship in the Offshore technology department of Dong Energy Denmark. From the deck at the oilrig Mærsk Endeavour I am watching the crane Thialf at The North Sea. 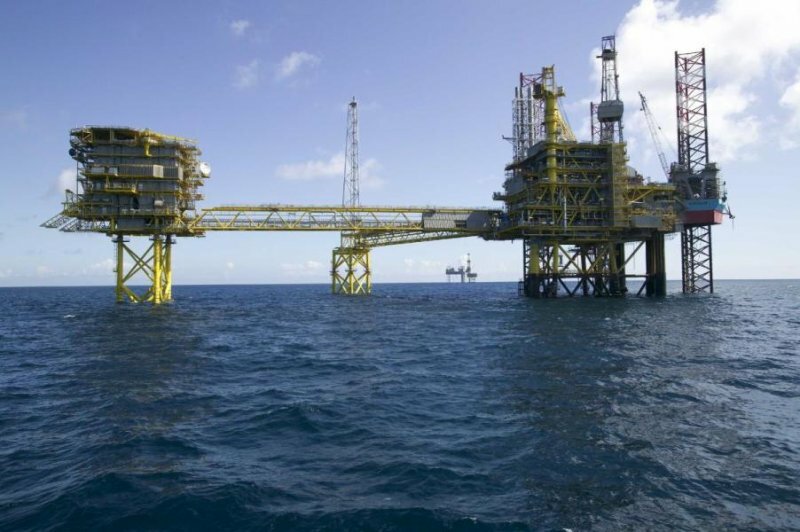 When modules and legs to platforms must be submerged, the work is made with the help from the world's largest cranes such Thialf. The crane lifts the entire module into [...]place. Thialf can lift 14200 tons and it costs about 1 million a day to rent Thialf. I also visited Thialf one. It was a huge experience to be onboard on such a big crane.